This image raises a number of potentially disturbing questions. Is this Andy? Is he really a toddler? If this is a baby, then should he be consuming greasy burgers and sugary drinks? And if Andy is an adult, why is he wearing a diaper? Are they Depends? Is this some sort of message about the infantilization of adult men? That would seem to make sense, given the fact that Andy appears to be wearing his ball cap askew. More important: would you buy something to eat from a business with this sort of mascot? 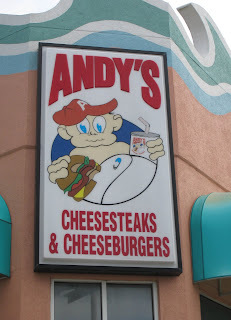 I can't be too hard on Andy's as they gave my son his first job when he was 16. But I agree that the mascot is disturbing. Babies eating burgers is not an image I would like to see if I lived in this area. I would probably not try the food just for that reason. Smiley Miley and Her "Special Friend"
Don't Ever Go against the "Family"